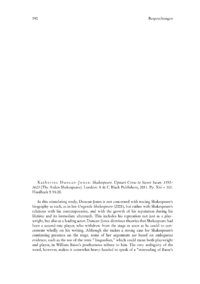 In this stimulating study, Duncan-Jones is not concerned with tracing Shakespeares biography as such, as in her Ungentle Shakespeare (2001), but rather with Shakespeares relations with his contemporaries, and with the growth of his reputation during his lifetime and its immediate aftermath. This includes his reputation not just as a playwright, but also as a leading actor. Duncan-Jones dismisses theories that Shakespeare had been a second-rate player, who withdrew from the stage as soon as he could to concentrate wholly on his writing. Although she makes a strong case for Shakespeares continuing presence on the stage, some of her arguments are based on ambiguous evidence, such as the use of the term Tragoedian, which could mean both playwright and player, in William Basses posthumous tribute to him.